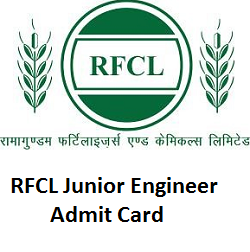 This page offers you with the complete information about the RFCL JE Admit Card 2019. The Ramagundam Fertilizers & Chemicals Limited officials announced that there are 53 vacant positions for the posts of Junior Engineer. Furthermore, candidates who applied for the posts will get the admit cards in the month of April 2019. The examination date is not released by the RFCL higher authorities. Hence, candidates should download their valid RFCL Junior Engineer Hall Ticket 2019 before attending for the exam. You can download the hall ticket using the link given at bottom of the page. The outline of the RFCL JE Admit Card will give a brief explanation of the posts available, the name of the post, job location, official website, selection process and so on. The coming sections will provide you with the required stuff. This is a good chance for the candidates who had applied for the post of Junior Engineer. As the officials have not yet released the exact dates for the examination, candidates can prepare for the examination during this period. The selection process for the RFCL JE Examination 2019 is very simple. Firstly, the applied candidates who reach the eligibility criteria will get the admit card for the written test. Then, the candidates who clear the written test will get a call letter, which is mandatory for the interview process. Once the candidate clears the interview round, they will be finalized for the post and get recruited by the officials. Candidates should check the details present on the nationalfertilizers.com Hall Ticket 2019 before attending for the examination. If there is any incorrect information, then report it to the higher officials. The information presented over the hall ticket will be in the following order. Candidates should be aware that there will be a verification process at the time of RFCL JE Examination 2019. The examiner will check the identification proofs of the aspirants who are attending for the exam. Hence, candidates are advised to carry some mandatory documents to the examination center. The documents list is mentioned below. You can carry any of those documents along with the nationalfertilizers.com Hall Ticket 2019 while attending the exam. Are you worried about how to download the RFCL Junior Engineer Admit Card 2019? Then have a look at the steps given below to download the admit card. Chemicals Limited official website – nationalfertilizers.com. Now, go to the careers section on the home page. On that page, you will find the Recruitment in RFCL link. Click on that link, then you will get the RFCL page. Now, on that page, you can find the article title section. Search for the required link on that article title. Then, you will get the desired link to download the RFCL Junior Engineer Admit Card 2019. Click on that link and fill the required fields. Then you will get the admit card of RFCL Junior Engineer. Download the admit card and also take the hard copies of the admit card. As the officials have not announced any particulars about the examination date, aspirants keep on preparing for the examination. Whenever the higher authorities of RFCL announces the information, we will update the news through our page. So, visit our website freshersnow.com frequently for the latest updates.